If you’re like me you sometimes get a little too busy to actually to stop and smell the roses. And here in the Palm Springs area we have that opportunity almost every day so there are few excuses not to! Just today I was driving through the luxury new home community of Stonefield Estates in Southwest Indio (Sheri Dettman & Associates represents the developer at Stonefield), and after some rare desert rain on Saturday these roses seemed extra special so I stopped, smelled these roses and took this photo. This view is looking southwest towards La Quinta and the nearby Santa Rosa Mountains. Note the two olive trees (non-fruit bearing olive trees) which also thrive year-round in the desert. 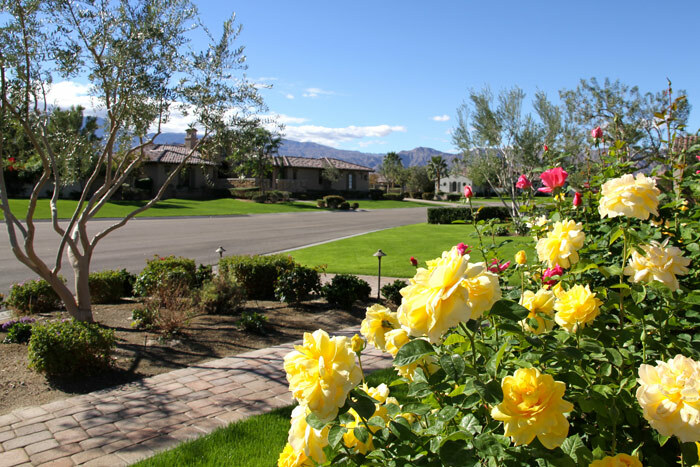 If you’re here in the desert don’t forgot to stop and enjoy some roses or other flowers or plants found here in the Palm Springs area–there’s plenty to go around! And if you’re somewhere where the sun isn’t shining and the flowers aren’t blooming right now, we can help you remedy that situation when you’re ready.